Here in the Borough of Richmond upon Thames, there’s great potential to make more journeys by bike or on foot, reducing congestion, making us all that bit healthier and generally making the borough an even nicer place to live in. This week Richmond resident Tim Lennon shares his personal experiences of cycling with his young family around the borough as part of our Better by Bike series. If you’d like a guest spot on our website to write about anything local and cycling related, do get in touch. If I want my eldest daughter to do something with me, the surest way to make sure she says ‘yes’ is to ask: “Do you want to go to [wherever] with Daddy, on the bike?” With her sitting behind me we can have a conversation, point things out, stop when we want to, and enjoy the scenery – and the journey – together. (“Daddy, the fire engine’s there! Let’s watch!”) She’s even happy to sit at the barber’s while I get my hair cut if we go there on the bike. And two children on the bike isn’t hard, either: when I need to take both girls, there’s a seat which slots into a bracket fitted to the front, and the youngest can sit there, in charge of all she surveys. And the best bit of it all: whenever we see something interesting, we can just stop: fire engine about to race past? Let’s watch it! Birds to be fed? Squirrels to watch? Sunsets to enjoy? Just stop the bike and do it. There are a million ways you can get out on your bike with children, and pretty much anything you can achieve in the car, you can achieve on the bike. For sure, there are situations where you might not choose the bike, but you’d be surprised, when you think about it, how many things a very slightly adapted bicycle is useful for. Particularly around Richmond, for the vast majority of journeys you’ll do, a bike with a child seat is a real, usable option. Taking my eldest to her gymnastics class? Five minutes on the bike, going through the fascinating cemetery. (Or 5-10 in the car, with nothing much to see, and the frustration of trying to park at the other end.) Otherwise, we could walk, which you need to budget 15 minutes for at least – more if she’d prefer to use her scooter or her push-along bike. I have a Gary Fisher Wingra – a middle-of-the-range hybrid bicycle. On the back is one seat, and on the front is the second. When my family and I go out together, my wife can use a seat on the back of her bike, so we can all see each other and talk to each other. Take the whole family on this one - count the seats! Practicalities – is it safe? Is it safe to take my children on a bicycle? Certainly: not only are you improving your life expectancy, but you’re giving them some fresh air, and showing them just how convenient and easy a bike can be. Clearly there are some roads that you’ll choose to avoid where possible. Although hardened cycle advocates would argue that only motorways are off-limits, in reality there are a number of roads in the area I won’t use when carrying children on a bike. Perversely, having a trailer opens up more roads to you, because you’ll find occasion when you can’t use a pavement, due to the trailer width. 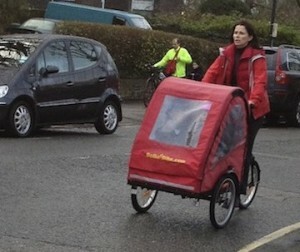 I’ve cycled on the A316 with a trailer, and it’s the only time cars and buses have given me a full lane’s space. It’s perhaps also worth mentioning that we don’t cycle with helmets or any particular special clothing, except when it’s especially wet – you don’t need to dress up for cycling any more than you dress up to go out for a walk. Practicalities – what do you need? Basically? You need a bike, and a seat per child. Normally children should be at least a year old before you get them on the bike, but before that you can use a trailer or box design, of which there are a number of options. If you’re not sure about putting them on the bike, and you don’t want to buy a new bike, you can buy a trailer for one or two children. 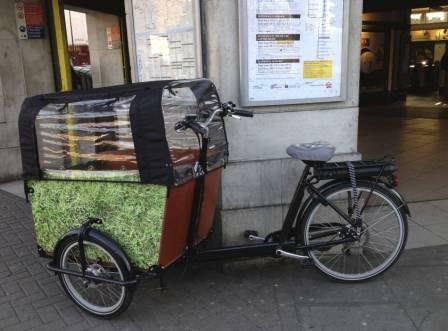 This is what we did initially, and a good trailer will also provide space to put things in – ours converts into a pram, so we could cycle to Kew Gardens or Richmond Park, un-hitch the trailer, and then walk somewhere for a picnic. Of course, if you are prepared to buy a new bike, there are some great options out there, at a wide range of prices, from a few hundred pounds for bike + seat, to over a thousand pounds for a Christiania bike or another unusual build. Probably the most important practicality is to make sure your bike is secure when you leave it: buy some decent locks, and lock it to something solid. You might remember the council ran its all-in-one survey recently. 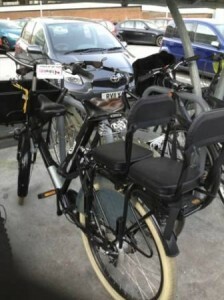 The things people complained about most are all things you can avoid on a bike: taking your children to theSteamMuseum? Avoid congestion, a fair bit of pollution, and parking problems, by using a bike. If you want to have a run-around on the green on the way back, parking up is the easiest thing in the world – on a bike you can stop pretty much where you want!